It was quite predictable that Stoke, a team with a reputation for tough play, should be able to roll over a typically soft-centered Tottenham side and so they did. Usually, I might just point out a few issues surrounding the dismal performance and proffer a positive solution but this week happens to coincide with a bit of research I carried out which paints a dismal picture of where Tottenham are with regard their inability to prevent chances. Amongst analytic types, this is not a new theory, i’m reminded of Colin Trainor and Paul Riley respectively highlighting and dryly remonstrating with Tottenham’s defensive issues. This plight has been a bit of an elephant in my room: I knew it was there, but tried to ignore it. Hugo Lloris has had a great season? Well, you only get that kind of swift analysis when a keeper is busy, and he sure has been. Quickly we can identify six of the top seven clubs occupying the top six slots, which makes perfect sense. As with overall shot ratios, Man City and Liverpool look better here than their league performances indicate; their problems have to a degree revolved around conversion. 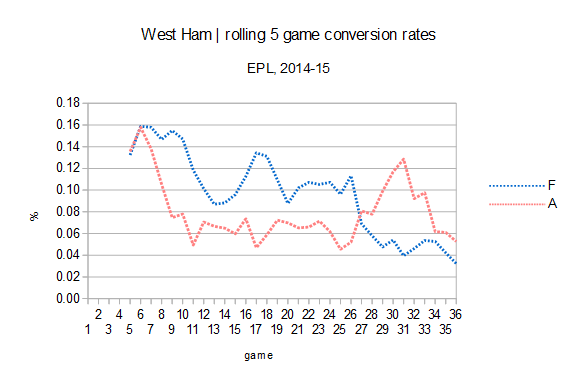 Tottenham, in contrast a team that has ridden fairly high for conversion has a serious problem here. A 44% shot ratio inside the box is incredibly bad, it pegs them as being as capable of creating chances in the box at the same rate as relegation candidates. Indeed the raw numbers show that they have conceded about as many shots here as Burnley, Leicester and West Ham, with only QPR significantly exceeding that total. These are not the hallmarks of a top side. 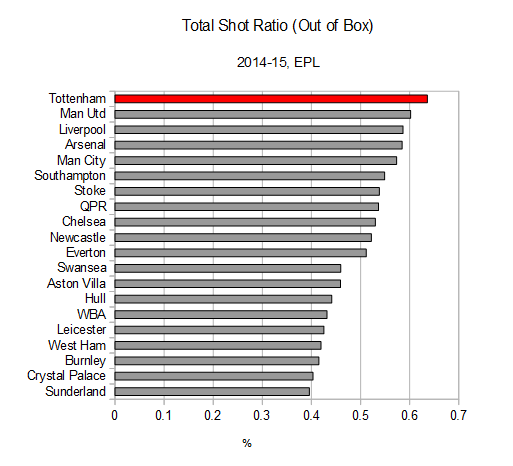 Overall, Tottenham’s shot ratios have declined year on year, and their overall TSR of 52% is the worst they have recorded in the enlightened era (2009-10 onwards). It is actually 7% worse than Pochettino achieved with Southampton last season and is ironically, identical to Stoke’s TSR, a team that whilst widely deemed inferior, has now beaten Tottenham twice. 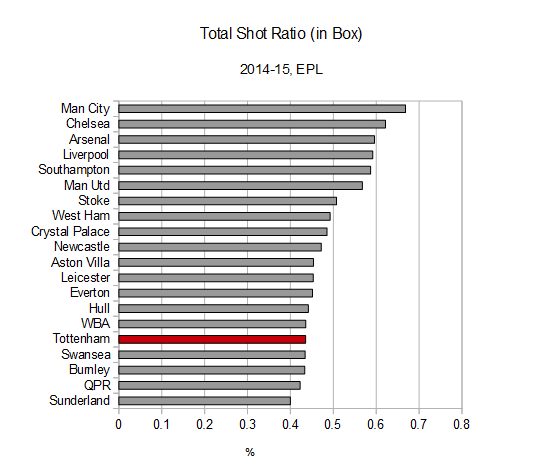 Tottenham take a high percentage of their shots from range and struggle to create opportunities inside the box. Defensively they have failed to limit the opposition’s ability to enter the box and take shots from within. In isolation topping a shot chart might seem good, but when wedded to failing in a more important chart, it is alarming. The similarities with the Villas Boas era are clear, as are the intransigence and the squad issues. The differences too: there is no shot dominance in 2014-15. I’m inclined to believe that the primary reason for this is systemic. On the front end, Kane is somewhat isolated in the 4-2-3-1 system and can lack support at times. In defense, the porous central midfield has been a common concern with attention slowly turning to the entire defensive unit. And the recent collapse in form is easily attributed to tiredness and a lack of rotation, but perhaps also to chickens coming home to roost? The narrow victories that characterised the mid-season have given way to draws and defeats, an inevitable by-product of a lack of dominance. Michael Caley wrote on this point last season with a case study on er… Tottenham. Both Villas Boas and Pochettino arrived with reputations as prescriptive and detailed coaches wedded to their systems and methods. Each has suffered with implementation and struggled to consistently succeed with their concepts in actual games. Tottenham (53) have conceded more goals that Sunderland (50) and Hull (49) and the same amount as Burnley. They rank 19th/20 for opposition conversion rates, no doubt powered by all those in box shots. Under Redknapp and in Villas Boas’ initial season, Tottenham punched above their weight and took advantage particularly of Liverpool’s wobbles to regularly finish 4th or 5th. However, during this time the team’s play consistently projected to be that good. What is most concerning now is that the projections start at 7th and could arguably be lower. There is a new team in charge of recruitment and a commitment to finding players in a younger bracket and developing them, much like with Bale or Modric, has been mooted. These are admirable policies but alongside this, the £100m splurge off the back of Bale’s departure seems to be held up as a mistake. I’d argue the error wasn’t in the intention but more the execution. To have any chance of challenging for top four places once more, a mix of promise and fully realised quality is necessary, otherwise 5th to 7th is the long term. It will soon be transfer season, the sale boards are up and the toughest negotiator in town has plenty to do. Rumours persist about higher level players departing and new blood is sorely required. Once more, expectations around Tottenham have had to be tempered. Improvement is required but this time it will be starting from a lower base than usual. The inevitable came to pass and QPR were firmly launched out of the league by Man City in a game that thoroughly represented exactly why they haven’t been able to claw their way to safety. The league has been largely free of hammerings this year, the sweeping goal laden attacks realised by City and Liverpool last season were reigned in by variance and key sales, yet with pressure lifted and a chasm in quality, City duly ran riot and converted with ease. QPR had no response and their inability to restrict shots and goals was exemplified vividly. I’m going to presume that he might have meant this in relation to the vast shot superiority Everton enjoyed. In out-shooting Sunderland by 22 shots to 10 he seems to have at least something of a point: indeed, of 162 games between 2009-10 and 2013-14 in which the home team had 22 or more chances and the away team had 10 or fewer, said home team won around two thirds of the games played. So a little overestimate from Roberto, but he’s in the ball park and sure, Sunderland rode their luck. The same shot analysis suggests that they may have won such an imbalanced game 13% of the time, a slight advance on Martinez’s suggestion. Just as Sunderland defied basic expectation we found Hull, nominally with the most straightforward match of the round, failing to beat Burnley in a match which may well end up relegating the pair. Again the shot stats suggest the result was unlikely: Hull out-shot Burnley 21 to 8 but the all important shots on target were few (3:2). Hull failed to work the keeper sufficiently, Burnley finally caught a break and managed to edge the game. Like a few of the lesser teams this year, I think Hull are okay defensively but their lack of goals has hit them exactly when they least needed it. In fact a few of my current projections rank them around 15th or 16th in the league, so with one win essential and even then it maybe not being enough, there’s potential to deem them unfortunate, at least right now. Their remaining hope is that the superior teams they now play Tottenham (A) and Man Utd (H) are coasting. And Newcastle? Having spent so long pointless, to achieve anything against West Brom was vital but they remain vulnerable to any Hull win. Shackle -free QPR are next as we continue the weird part of the season where the already dead have an opportunity to further condemn. Over the last ten games they have fallen in a conversion hole and it has meant only five goals. But in a week where on Match of the Day, Phil Neville chatted about shots on target rankings and we saw pass and touch maps too, it is encouraging to see the language of the numbers being used with ever-more frequency. Since last March I’ve written over 40 of these weekly round-ups and part of the fascination here is the constant quest to derive understanding from numerical data- the story lines are buried all around, some require extensive digging to identify whilst other lie lightly on the surface. All of them describe and/or support truths that possibly can be ascertained via other methods and importantly broaden understanding. And after all, that is what we are looking for here and why you may be reading this article. In a complex and multifaceted sport, the “why” is endlessly fascinating and one hopes that a wider scope of interest is being achieved. Fans! Don’t fear the numbers, they offer some security and stability in an emotional world.